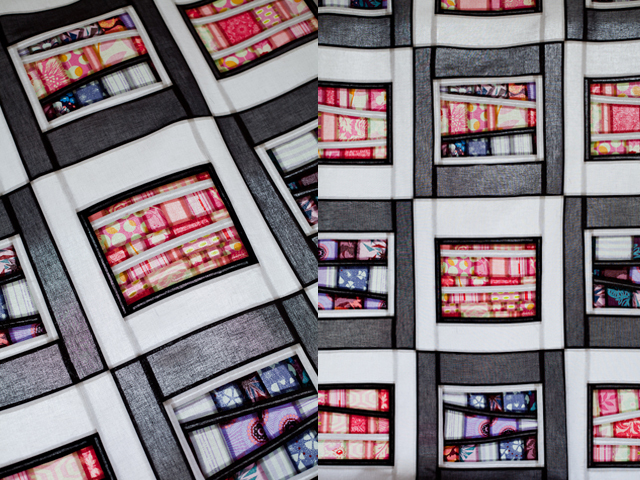 Paula Wessells: Quilting | can fabric be negative? really? 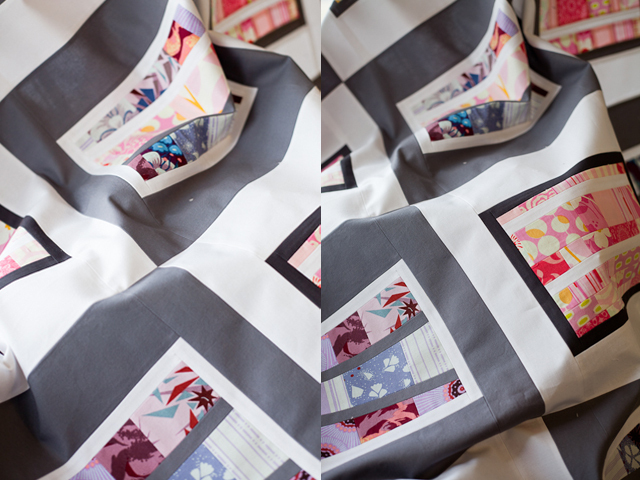 Quilting | can fabric be negative? really? 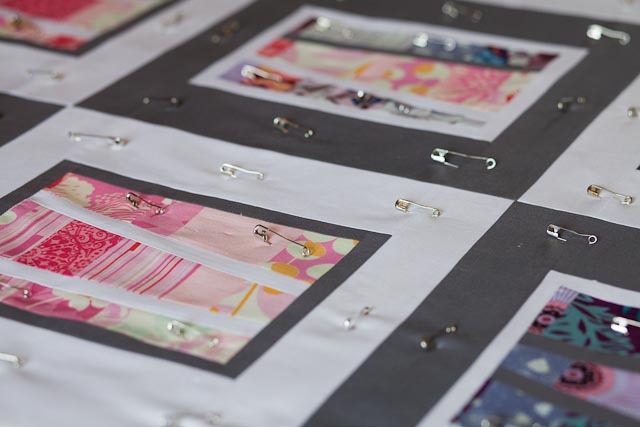 One of the many things that I have enjoyed about starting this new craft [besides the fabric accumulation] is the outpouring of support quilters give. What I have witness over the last couple of months was the amazing ability of how fast a group can come together and set aside everything to help complete strangers. This type of support keeps a community together, and by community I mean the larger group of craft enthusiasts that share the same interest. Unfortunately, amongst all of this support, negativity has sprouted [maybe it's been there for awhile, I don't know]. I have read a few posts on some blogs that I admire and have chosen not to read any deeper. What I am trying to do is learn from the first time around. For those of you that are scrapbookers reading my blog [thank you!] remember those nasty nasty days... when you didn't even venture onto Two Peas or regretted when you just couldn't stay away from Scrap Smack?? Good lord. And I know you shouldn't take all of that to heart - it still wears on you, even if it's not about you. It's depressing and not to mention energy draining. To tell you the truth, probably one of the other reasons I haven't even scrapbooked in so long. For those of you that follow me on Facebook [if you don't there is a link on my side bar, say hi!] you know I had been working on some blocks for a group I found on Flickr called do.Good Stiches. It was started by Rachel and it really caught my attention because of the way it is set up. You can read about the details, but each group donates a quilt a month to a children's charity. My group is called Peace and our charity is My Very Own Blanket. For my first month [April] we made this block by Don't Call Me Betsy and I was hooked, love this block! These blocks have been delivered to the quilter for the month and in the next month will be all put together to create a quilt for a child in foster care. This is good stuff! While the blocks came together fine, I was more excited about getting together for my first real live quilting bee at Cherri's. 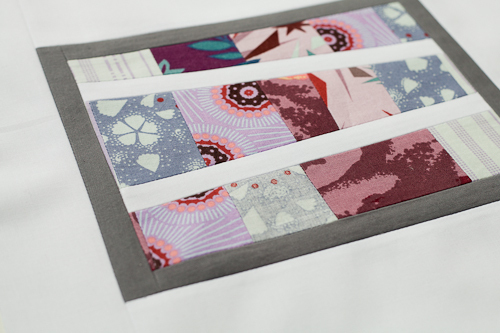 It was so much fun - found out that I am slowest at hand sewn binding, that is one multi task I can't multi task. It was great to sit and get to know Jill, Bev, Rachel, Monica, and Marcia from the guild. Plus I learned a few things... don't have your thread longer than you and expect not to have tangles and knots. duh! All of this socializing and learning but coming together for the greater good. I came home after a long night and was excited to sandwich and quilt my top. I will spare you the detailed issues, but let's just say my quilting did not turn out like I expected and I was rushing to finish the binding at the meeting so I could share and hand off to Susan. Who by the way is so sweet, inspiring and has a new book out on modern log cabins . If you are still with me let's revisit: So what is it about crafting that brings out the worst in people and also the best? Now that I have distanced myself from the scrapbooking world I can hypothesize on how things went sideways - scrapbooking at it's core is an individual craft. It's your photos, your memories, your family, or you. Add in all the social events, classes, people telling you - you can scrapbook or how to scrapbook, lots and lots of direction and the marketing, all the brilliant marketing to get you to buy, oh and let's not forget the INTERNET, the protective shield of the internet...now all of a sudden it has become more about 'all that' and less about you, even though you are still scrapbooking the same photos: yours. Enter in negativity, guilt, insecurities that surface....ewwww. This is my hypothesis, my opinion - I am sure many of you can add to this! 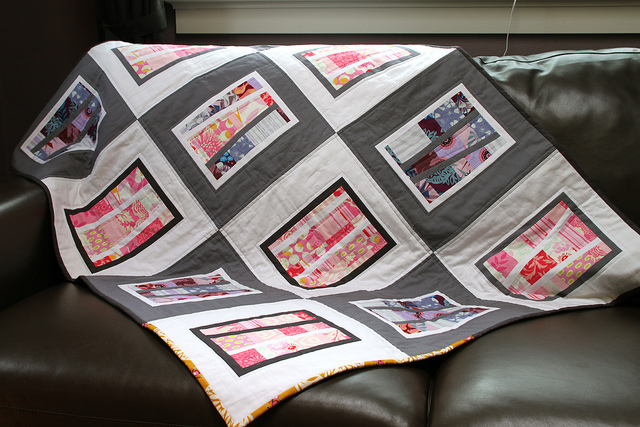 Here is my hope - quilting started out as a group effort. People getting together for a purpose - I am not an expert on quilting history but I am pretty sure that is why we have quilting bees. There was a sharing community to begin with and because of that my hope is that they continue to be strong. Beautiful quilt! Love your design and fabric selection. Gorgeous quilt! Do Good Stitches is such a wonderful bee. 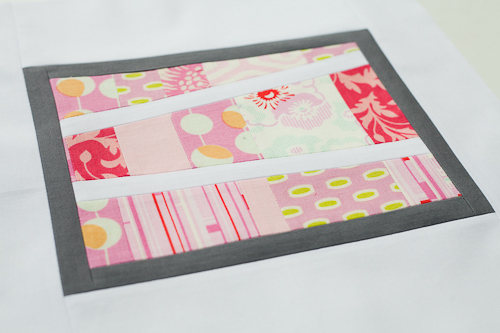 Thank you Lori and thanks for stopping by the blog!!! Wow...is about all I can say! I really have to agree with all that you said and for most of the reasons you stated, if I scrapbook, I prefer to do it by myself or with others who think and feel the same way I do. Scrapbooking has never been a sport! One of the person with the most products wins. I just finished my second quilt and am in love and can't wait to make many more. Thank you for all of your inspiration! I have to say ditto to Kim's comments regarding scrapbooking. I'm right there with you Paula, I scrapbook for me . . . my photos, my adventures, my memories, my way. I love the convenience of my laptop and I don't have to lug all that gear to a crop, just direct me to a power source and I'm a happy cropper. 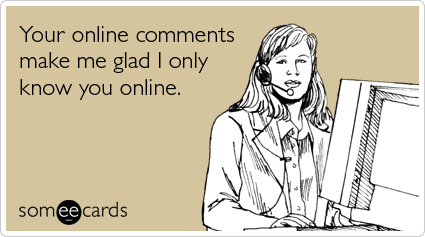 How sad that online forums that should help foster creativity and friendship can often turn so very ugly! I have only visited the 2 Peas forums a couple of times and I left feeling terrible....people were so mean! I am glad that the Club CK forums are friendly and that is where I spend my time free time. Gorgeous quilts and an awesome cause. I had a stash of older fabric that I recently sent off to a group of ladies in Florida who sew blankets for foster kids and little ones in the hospital. I was never going to use the fabric and it was nice to know that it is being used to create something for a child in need. I am so glad that there are still nice people in this world who want to help others. Great job Paula! So true Kim - I am so happy that you caught the quilting bug. I want to see this quilt you finished!!! Hi Shanon - you know it's so good to get to 'chat' with you again! :) Gosh I haven't been to 2Peas in ages but i had the same experience and very intimidating, especially for a new person. Is that a Moda cross weaves? I think what you have to say about why you don't scrapbook anymore is why I can't get myself into the sewing room. Something that I have done since I was very small, and grown to enjoy more and more over the years, is something that I want nothing to do with anymore. The negativity out there really gets to me. I take it all way to personally and get so tired of the bickering that I start to distance myself and want to get away from it. It's sad and terrible at the same time, because I am distancing myself from great friendships, but it's one of those things I can't help. We'll just have to see where the next few months put me. I like your take on this topic - great post! I can totally relate to how you are feeling. It is hard. I find myself distancing myself from this new found craft in fear that it might turn into what I just experienced. Negativity is just bad all the way around. Hope we can make it through!! !